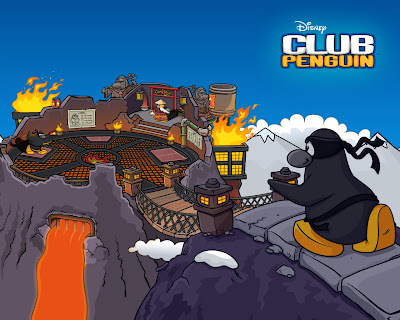 Club Penguin Cheats by Mimo777 Club Penguin Cheats by Mimo777: New Club Penguin Jitsu Fire Ninja Wallpaper! I don't like a lot of the Club Penguin Wallpapers but THIS ONE IS COOL! oh sweet! this one looks pretty cute as well! i like the penguin carrying the light. for some reason it just makes me feel good. :D im happy now! YAY!!! MIMO meet me on sleet right now in mine!!! I love that one! That is my wallpaper now! Sorry pal! If Mimo went and met you, he'd have to meet everyone else! But you can meet him at one of his parties! Or on Webosaurs! Oh I HATE that! I don't even have another page open! I love happy! Light causes happieness, hm? That actually is an interesting point! When you think of ninjas, you think of some menacing guy with a sword, right? but YOU think "Cute" That's AWESOME! CP is cooliness! Mimo won't go on CP when you ask because then with all Mimo's fans every second of every day Mimo would be running after one penguin after another. mimo i found a cheat to do with fire card jitsu if u walk up to sensei with a anniversary party hat on he says 'i see your wearing an anniversary hat' i like pointy hats! umm they made this wallpaper weeks ago! I had it b4 you posted this, LOL! Ya, it's the coolest one yet! Uh, he isn't carrying the light. It just looks like it because the light is in front of his Flipper. He is just running, I think. hey mimo this is the first time i comment i was visiting this site for about a year now soooo ummm wat was i gonna say??? oh ya i really like the new jitsu fire game and the wallpaper makes it alot more better so thx alot mimo! cool and get this i get in the ninja hideout without being a ninja you use the card about the new game! Yeah. This wallpaper has to be the best one yet. Penguins did you know you can use a wallpaper as a backround! Sorry Anonymous, but Mimo can't go and meet every person who asks him to go somewhere. He is always very busy. He will only add you if you are a Mimo Mod or a Mega Mimo Mod. cool mimo,but the wallpaper has actually been out for over a week now,lol! Hey Mimo i just became a fire ninja!And when I entered the hideout the fire amulet on the floor was glowing just like in the video!! !There's a video I created on youtube:just type "Club Penguin Fire Amulet Glowing!" Maybe try clearing your catche and reading the page on CP's blog called technical questions? If it dont work try contacting CP by emailing them. Yep, also your amulet that you wear on your neck glows red. Ice rink returned today , mimo .Post it quickly . ~~~~~~~~~~~~~~~~~~~~~~~~~~~~~~~~~~~ There are three solutions.One maybe you had another window open.Two u might have had another tab open. Three e-mail CP. Metalp10 CPG MOD IN TRAINING! I'm sorry but Mimo can't come because he's really busy. You would have to be a Mimo Mod or higher for him to add you though. 99% percent, the probability is going to be most likely yes! I'm thinking that too! I think Snow will be on the Tallest Mountain and Water will be on the Waterfall! Awesome! welcome to Club Penguin Gang! Ask any questions if you need help! I think that ALL NON FIRE NINJAS can see It. At least I think. dude it's been out like 3 or 4 days. hey mimo.. great news.. the quest of the golden puffle is coming back soon! The quest of the Golden Puffle is coming back soon!!! when does coins for change come? Sorry, Mimo already posted this you can scroll down. It says Bye bye soccer pitch, then, hello ice rink. Sorry Mimo won't meet you or else he would be up all night meeting ppl. Report this to Club Penguin Support. They will be glad to help you! Sorry but Mimo cant. If he did then EVERYONE will be asking times and dates to meet him. Please let this pass Mimo! hmmm... yes well i think thats were BUT mabey theres something covering the pipe.And for your thery about the pool ITS NOT UNDER THE RINK PROBLY. I have always wondered why if the pool is under the plaza why do you see the ocean through the windows?